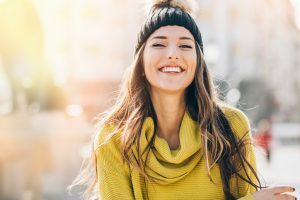 Why Veneers from Your Cosmetic Dentist in Marysville? For years, the gap between your front teeth has bothered you. Now you see that your tooth enamel is deeply yellowed and dull. Could your otherwise healthy smile look younger and more refreshed? It can with porcelain veneers from Darby Creek Dental in Marysville. These super-thin ceramic shells beautify teeth spoiled by defects such as deep stains, spaces, mild crowding and chips. Getting veneers is easier than you may think. It starts with a cosmetic dentistry consultation with Dr. Cleveland, Culley, Budendorf or Tschand at Darby Creek Dental.The dentist examines your mouth and also takes photos, digital X-rays and other imaging to send to a dental lab. He or she measures your teeth and takes oral impressions. From the impressions, a master ceramist crafts a three-dimensional model of your mouth. The model helps the technician make the veneers the right configuration, size and length. The resulting veneers will help your teeth look natural–only better! Also, the doctor removes a thin slice of enamel off each tooth.This reduction of enamel allows space for the porcelain veneers to fit properly and comfortably within your oral cavity. The dentist also places temporaries over the prepared teeth to keep your smile natural-looking while you wait for your permanent veneers. At the next appointment, the cosmetic dentist in Marysville bonds the veneers in place with a special permanent adhesive. She adjusts the color of the veneers by varying the shade of the cement. She hardens the cement with a special curing light and ensures teeth close together comfortably. Should You Get Porcelain Veneers? Your cosmetic dentist will help you decide if veneers can meet your smile goals. For example, your teeth should not be sensitive and must be free from decay. Gums must be pink and healthy. If a tooth is severely fractured or chipped, the doctor may advise a porcelain crown to cover, protect and beautify the tooth. Also, the best veneer candidates have realistic goals for their smiles. You must realize that a cosmetic dental treatment greatly improves your appearance. However, do not expect to look 30 years younger. Lastly, common sense says you must take care of your teeth–veneers or not. Brush twice a day with a soft brush and floss daily according to American Dental Association (ADA) recommendations. Treat veneers gently. Don’t bite hard foods, such as peanut brittle or ice, or tear open plastic packages with your refurbished teeth. Of course, all cosmetic dental patients should come to Darby Creek Dental twice a year for routine examinations and professional cleanings. Exams include a careful check of existing restorations and cosmetic treatments such as porcelain veneers. The professional staff at Darby Creek Dental is very experienced in treating complex dental cases, and the dentists have the manual dexterity, training and artistry to achieve beautiful smiles. If porcelain veneers sound interesting, contact Darby Creek Dental for a cosmetic dentistry consultation. This exceptional aesthetic dental service could make those smile defects disappear forever. Comments Off on Why Veneers from Your Cosmetic Dentist in Marysville?